In the late 1980s, I established vegetation study plots at 10 sites along the eastern side of Glacier Bay in southeastern Alaska. These sites were more or less evenly spaced between the retreating Muir Glacier and the terminal moraine which the Glacier Bay ice had built at the end of the Little Ice Age. The youngest site had been exposed by retreating ice in 1968 and the oldest site had been exposed around 1770 soon after the ice melted back from the 1740 moraine. So on average the age difference between “consecutive” sites was about 20 years (202 years ÷ 10). You can assume the sites form a chronosequence so that changes inferred from the series of progressively older sites are also changes that have happened at individual sites. According to this assumption my older study sites would have passed successively through stages similar to all of the younger sites. You can be less trusting of the chronosequence and use evidence at each site to reconstruct its developmental history. This history can be compared to younger sites and to their histories to test the above assumption. Tree rings and paleoecology are potential sources of information about vegetation history at individual sites. You can wait until each site attains the age of the next older site at the time of establishment. At that time Site 1 should look just like Site 2 did when you started, and so on. If the chronosequence assumption is valid, each site will have aged predictably and you will have a new, slightly older, and now verified chronosequence. You can have some confidence that inferences about change made from that chronosequence are valid. Universities take a dim view of spending two decades to finish a dissertation, so mine included only approaches 1 and 2 above. Time waits for no physiographic ecologist, and it’s been more than 25 years since I established the study sites. Advanced age has its drawbacks, but at least approach number 3 is now an option. I described the changes that have actually taken place in the 28 years since I established plots at my youngest study site (Site 1) in a previous post. When I took photos of plots at that site last month it had been out from under the ice for 50 years. My second youngest site (Site 2) was exposed in about 1944 and I took photos of those plots in 1995 when the surface was about 51 years old. Data from the plots will provide a robust test, but comparing the photos is my first opportunity to use approach number 3. In this case the photos are all we need to learn that the chronosequence comes up short. Four examples of the 2018 vegetation in my study plots on a surface that is 50 years old (Site 1, my youngest study site which was ice-free in 1968). In this part of Glacier Bay, five decades produced a carpet of Dryas with scattered willows and young cottonwood trees. Small Sitka alders (7 total) were found in 2 of the 5 plots. One might expect the photos taken in 1995 at my second youngest site would be similar to the photos above. In 1995, the site below was about the same age as site above was this year. 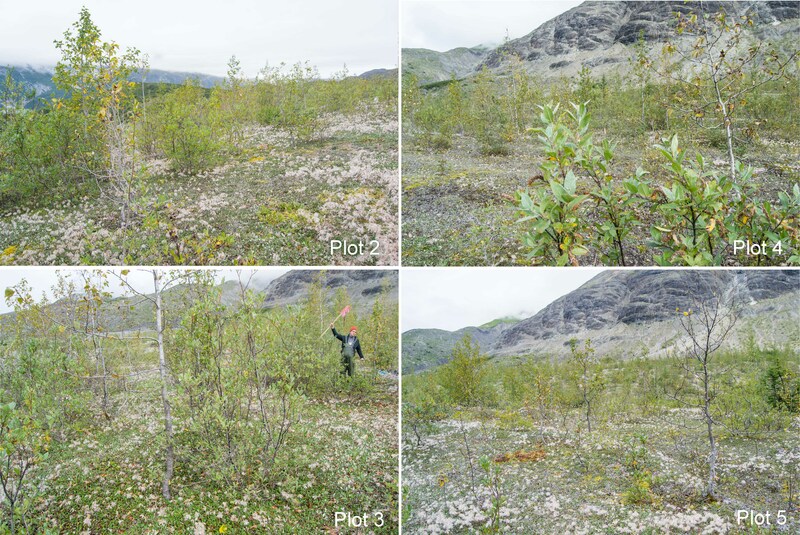 Four examples of the 1995 vegetation in my study plots on a surface that was 51 years old (Site 2, my second youngest study site which was ice-free in 1944). The six other plots at this site look just like these. In this part of Glacier Bay, five decades produced a dense shrub thicket of Sitka alder with scattered cottonwood trees. Almost all of the shrub stems are alder. Kodachromes taken 5/24/1995. The eight photos above are of post-glacial surfaces that were about the same age when photographed. This is a dramatic failure of the chronosequence. Thirty years ago it would have been a mistake to use Site 2 to predict what Site 1 would look like in 30 years, and a mistake to use Site 1 to imagine what Site 2 looked like in the past. The failure is more severe when the ecological differences between the two sites are considered. In 1995, Sitka alder had been fixing atmospheric nitrogen (N) at Site 2 for a couple of decades. Alder fixes N rapidly compared to Dryas or any other plant at the sites, so the difference in N available for plant growth is probably substantial. 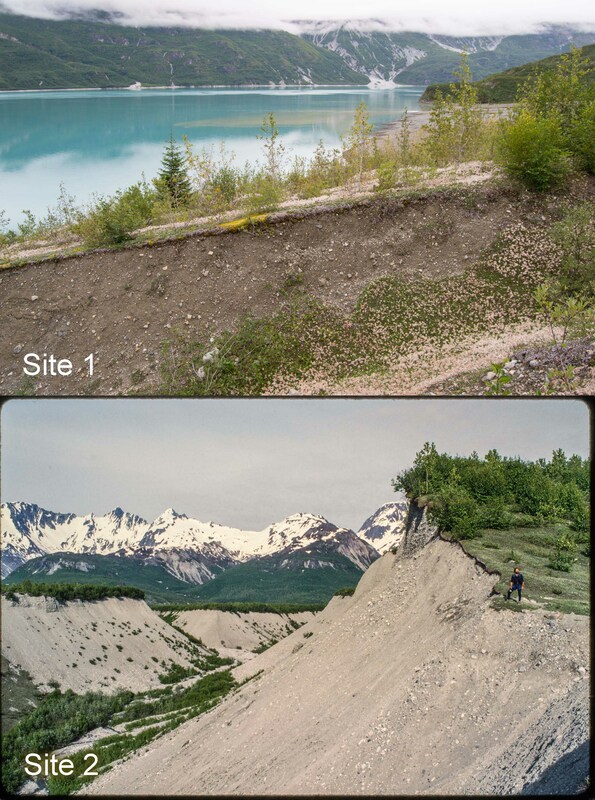 These two sites could be headed in very different ecological directions. Here are some hypotheses which might explain this result. 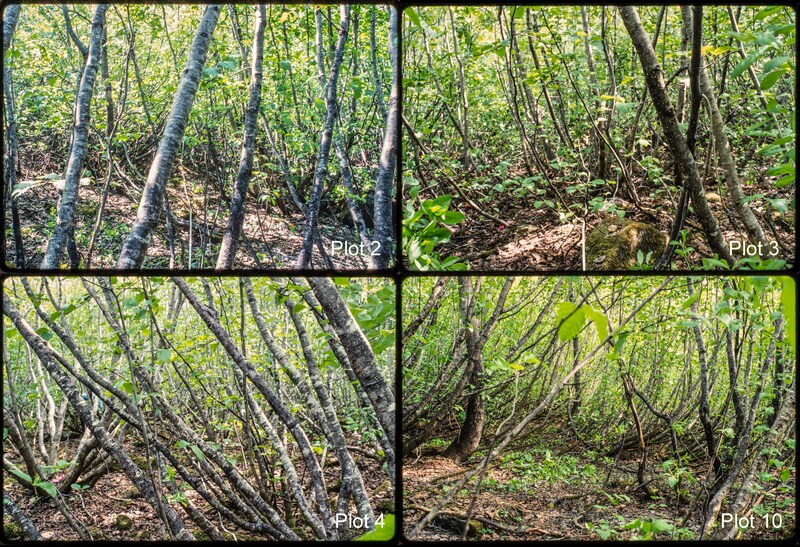 I assigned the wrong age to the surfaces and the alder thicket at Site 2 has actually had a longer time to develop. A lot of people made maps and took photos of the glacier positions at Glacier Bay in the 20th century, and air photos show the ice fronts well in the last several decades. I don’t think my surface dates are very far off. The soil at the two sites is different and supports different plant communities. Both sites are on very deep deposits of glacial outwash which were deposited as the glaciers advanced 2000 to 4000 years ago. At both sites the glacier rode over the outwash and later left behind a layer of ablation till as the ice retreated. The outwash and till are probably well homogenized, so the soils should be very similar. There could be differences in substrate properties, but probably not different enough to explain this result. The climate differs between the two sites. The two sites are only 12 km apart and both are 30 to 60m above sea level. It’s not likely that climate could differ sufficiently to account for the dramatic vegetation differences. Alder grows well at the younger site, there are just not very many of them. So alder has not been excluded there because of climate. Alder seeds arrived at Site 2 soon after the ice melted away, but arrived later or in lesser quantities at Site 1. Yup, that could be it. There is some good evidence to support the seed rain hypothesis. I will present that case in a new post. The soils at both Sites 1 and 2 are formed in deep deposits of outwash and till. There is no reason to suspect that soil properties are responsible for the dramatic differences in vegetation development between the two sites. Top: 8/25/2018. Bottom: Kodachrome from 5/22/1995. Another piss-poor hypothesis might be differential seed/seedling predation between sites. Yes, all of those alder seed/seedling predators who find their way to the only place in Muir Inlet with no alder seeds/seedlings. I think Darwin has an award for them.